The most amazing growth story of the first quarter of 2011 is that of Mendeley, jumping half a million articles downloadable for free, from 300,000 to 800,000, growth of 171% in just one quarter!! Since Mendeley is a DIY tool for researchers, this amazing growth illustrates that there is a considerable appetite for self-archiving, once the researcher has a service that appeals to them. (See Mendeley update at bottom of this post for more). Analysis this quarter focuses on the strong growth rate of so many open access initiatives in comparison to the overall 3-3.5% average growth of scholarly articles and journals. Data is presented that strongly suggests that the success rate for open access journals is already higher than that of subscription journals in this and a related post, Those Active Open Access Journals!. Congratulations to DOAJ for announcing the DOAJ new interface - and surpassing the milestone of more than half a million articles available through the DOAJ article search! As DOAJ's Anna-Lena Johannson expresses it: DOAJ now has more than 6,300 journals, more than 100 countries, over 50 languages, and more than 2,500 journals providing metadata at article level. . Another indication of the international reach of the open access movement from Katarina Lovrecic; there are 133 OA journals in Croatia, and 129 or 97% of the journals in the Croatian Hrčak portal are open access. An additional 47 journals are actively participating in PubMedCentral; the growth for journals in PMC providing immediate free access is 40, and the full open access PMC journal growth rate is 33. This issue of the Dramatic Growth of Open Access introduces two new features for the very busy - a quick numbers section, and a quick reference edition. 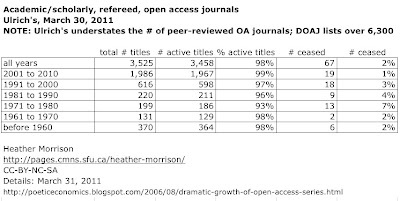 # of open access journals (DOAJ): over 6,000. Growth rate: 4 per day. # of freely available journals (Electronic Journals Library): over 28,000. Growth rate: 10 per day. # of open access repositories: close to 2,000 (OpenDOAR). Growth rate: 1 per day. # of documents freely available (BASE): 25 million. Growth rate: 6,000 per day. # of open access mandate policies (ROARMAP): 271. Growth rate: 1 per week or 5 per month. For more detail and references, see the Quick Reference. The Quick Reference is available for downloading as a PDF or excel file from the SFU IR. These charts illustrate just how dramatic the growth of open access is, in comparison with the overall average growth rates of scholarship of 3% (for articles) and 3.5% (for journals) calculated by Mabe (and cited by Ware). In 2004, a little over 62,000 articles were searchable through DOAJ, compared with over 500,000 today (490,000 at the end of 2010). IF DOAJ article search had been growing at the average rate of 3% per year, there would now be about 75,000 articles available through the DOAJ article search. 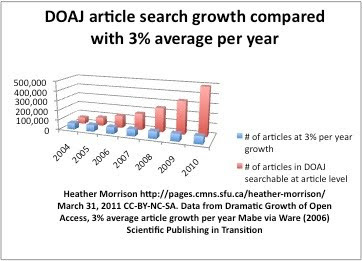 DOAJ article search has grown about 7 times what one would expect given the average scholarly article growth overall over the past 6 years. 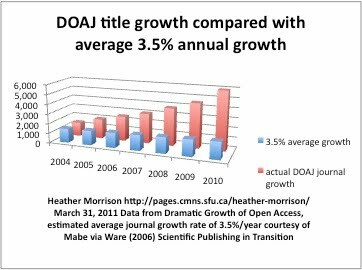 Similarly, DOAJ titles are growing much more rapidly than the overall average growth in scholarly journals of 3.5% annually. In the past 6 years, DOAJ has grown from 1,400 to over 6,000 journals. At the average 3.5% annual rate, DOAJ would now be at about 1,700 journals. DOAJ journal titles are growing more than 3 times faster than the average growth rate for scholarly journals. 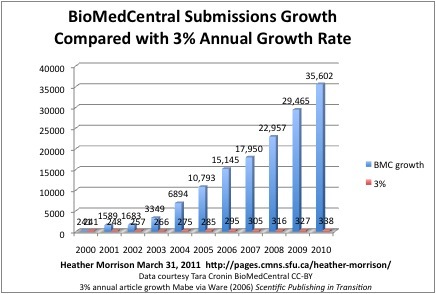 In the past 10 years, BioMedCentral has grown from 241 submissions to over 35,000 submissions annually (thanks to BMC's Tara Cronin). IF BMC were growing at the average rate of 3%, we would expect only 338 submissions annually! BMC article submissions have grown over a hundred times more than one would have expected at the average growth rate for scholarly journal articles. In a related post, the phenomenon of Those Active Open Access Journals is explored. 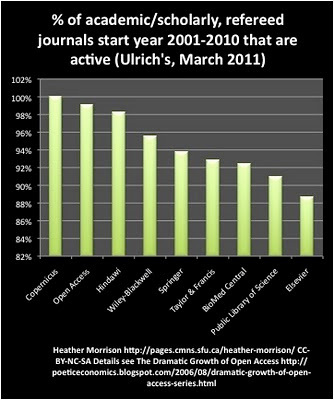 It seems that - according to data obtained from Ulrich's - there is strong evidence to suggest that open access journals are more likely to continue to be active after a few years than journals published by some of the top commercial publishers! Downloadable data for the Dramatic Growth of Open Access can be found at the Dramatic Growth of Open Access Dataverse. 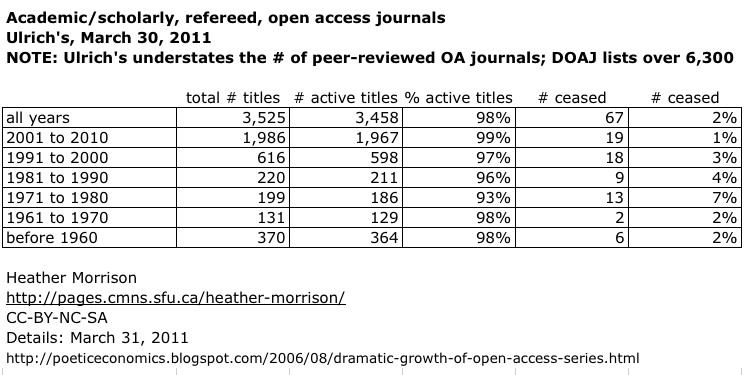 Heather, Thank you for the data from your Dramatic Growth of Open Access series. The latest release certainly begins with a striking figure, but it probably needs some explanation and context. Where do the figures for freely downloadable articles from Mendeley come from, and what is meant in Mendeley by 'self-archiving'? Comment: it sounds to me like this sort of initiative has tremendous potential to advance the open access archiving movement. If self-archiving in the IR facilitates getting your work into services that faculty seem to like such as Mendeley (and what about academia.edu), that would only help with getting content into the IR. Plus I wonder what the possibilities are for linking back FROM Mendeley to the IR (or other library services)? Any discussions happening along these lines? Cronin, T. (2011). Personal correspondence. Mabe, M. (2011). Personal correspondence. Those ACTIVE Open Access Journals! In brief, this post presents data illustrating that scholarly open access journals have rates of ongoing activity that compare VERY favorably with subscriptions-based journals (i.e. not being cancelled), based on data gleaned from Ulrich's. Also worth noting is the number of journals going back some time that are now open access - 370 journals listed as open access in Ulrich's started publishing before 1960, and of these, 98% are still active! All of the searches that I am talking about are limited to academic/scholarly, refereed journals. Ulrich's lists 3,525 such open access journals (a far cry from DOAJ's more than 6,300). 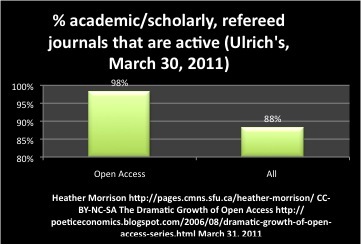 Of the journals listed in Ulrich's as OA, 3,458, or 98%, are listed as active. This compares VERY favorably with ALL academic/scholarly, refereed journals, a total of 32,058, of which 28,269 or 88% are active. Could this reflect a certain reticence on the part of Ulrich's to include open access journals until they are pretty sure that they are going to be around for a while? That would explain the discrepancy between Ulrich's OA journal list and DOAJ's. Let's look at a few other figures. The chart on the left shows the percentage of active journals by publisher. On the left-hand side, we see that the publishers with the highest percentage of active journals are open access publishers Copernicus and Hindawi with 100% and 99% active titles respectively, while on the right hand side we see that two subscriptions-based publishers, Elsevier and Taylor & Francis, have a much lower percentage of active titles overall, 85%. The chart on the right shows the percentage of active academic/scholarly, refereed journals for open access as a whole, and for a few selected publishers both open access and subscriptions based, for journals started in the last ten (10) years, from 2001 to 2010. Note that on the left side of the chart, open access publisher Copernicus has the highest percentage of active journals, 100%, followed closely by open access as a whole with 98%. On the right hand side, we see that Elsevier, with 89% of journals started in this time frame still active, has a lower percentage of active titles than at least 4 open access publishers (Copernicus, Hindawi, BioMed Central, and Public Library of Science). Still, this could reflect a hesitancy about open access on the part of Ulrich's. I should note here that I needed to correct some of Ulrich's figures, as a number of thriving PLoS journals were listed as cancelled, apparently because they cancelled print subscriptions (in favor of a leading-edge print-on-demand service). 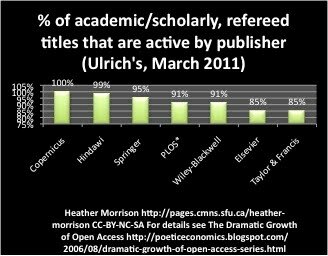 If Ulrich's is hesitating to add open access journals, perhaps this reflects a tendency to be conservative about adding new titles or publishers. This might make some sense - even DOAJ waits to be sure that a new journal actually publishes a bit before adding titles. To account for this, I looked at open access journals from a wide time range, and found that the percentage of active academic/scholarly, refereed open access journals was 93% or better for every time range I looked at, going back to before 1960! Needless to say, this compares VERY favorably with the 88% active titles for ALL academic/scholarly, refereed journals from all time ranges. Just came across this review of my book Scholarly Communication for Librarians (Oxford: Chandos, 2009). NO to Google Books Settlement. Hurray for academics, access to knowledge and democracy! Today Judge Chin released a judgment Declining the Google Books Settlement. This is a victory for academia, access to knowledge, and democracy - here is why. The Google Books Settlement is an attempt to settle a class action suit brought by some authors and publishers objecting to the Google Books project. The Google Books project per se involves digitizing library collections to provide searching for in-copyright works with fair use snippets and free access to out-of-print works, a very worthy project. The Settlement, however, had some major flaws, as Chin's judgment notes. One significant flaw is that the plaintiffs do not represent all authors, and objections by academic authors are noted in particular: "The academic author objectors, for example, note that their interests and values differ from those of the named plaintiffs: "Academic authors, almost by definition, are committed to maximizing access to knowledge. [emphasis added]. The [Authors] Guild and the [Association of American Publishers], by contrast, are institutionally committed to maximizing profits."" (p. 28-29, quoting Samuelson). Comment: hear, hear!! Kudos and thanks to the academic authors and authors groups who took the time to express objections. Several other flaws in the settlement suggest that turning down the Settlement is a victory for democracy as well. The settlement is described as "an attempt to use the class action mechanism to implement forward-looking business arrangements that go far beyond the dispute before the Court in this litigation." (p. 21). Antitrust concerns (an effective Google monopoly on orphan works) are cited as well. The Settlement brings in involuntary participants, including owners of copyright in orphan works and foreign works; the objections of foreign nations are noted. As the Settlement notes, issues about copyright should be addressed by Congress, not through this approach. For the future, let's hope that fairer and more appropriate approaches to copyright, including limiting terms (can we go back to 14 years, renewable once please?) and addressing orphan works is brought up in legislatures and international copyright venues, soon. As for publishers and authors of works that are IN copyright, instead of suing people, why not focus on getting these works digitized and available through attractive business models such as free online / pay for print on demand? Will Google survive Google Books? Reflections from a Friend. Postscript: THANKS to Google and participating libraries for pushing the envelope. Clearly, more work is needed, but progress to date is already showing the potential and articulating some of the challenges still to be overcome. The first draft of the introduction to my thesis is now available and posted online as part of my commitment to an open thesis approach. Comments (moderated) are welcome and will be gathered on my SFU website. For now, the commenting function there does not appear to be working, so please e-mail me at hgmorris at sfu dot ca. I will assume any comments are for public posting unless notified otherwise. Many thanks to my senior supervisor Rick Gruneau for working with me on this experiment. One question that often comes up as we transition to open access publishing is how to assess new open access journals. How do we know that these are legitimate? Here is my answer, informed and inspired by conversation on the SCHOLCOMM listserv, and reflecting my own perspective. THE KEY QUESTION for assessing the quality of any academic journal, is whether the journal is the communication vehicle for a group of serious scholars committed to appropriate quality control such as peer review. If you have received a solicitation to participate in an academic journal, who did this come from? A colleague that you know and trust? A leader in your field? Or someone you have never heard of? Who edits the journal? Again, people you know, leaders in your field? In the case of a new publisher that you heard about from someone who don't know, it is a good practice to double check with people whose names are listed as being on the editorial advisory board, as there have been instances of new publishers listing people without their knowledge or permission. Note that if the journal is legitimate, the editorial board member will appreciate your interest in the journal. Are the peer review guidelines posted on the website? If so, are they appropriate for this discipline? If the journal has already published some issues, what is the quality of the work included? Who publishes this journal? What is their mandate and reputation? There are many not-for-profits involved in publishing, including university presses, university libraries, and scholarly societies. The not-for-profit mandate is not a guarantor of quality, but it is a strong indication that the primary motive is scholarship rather than profit. Reputation is another important indicator. A number of open access publishers, both not-for-profit and for-profit, have earned a reputation for quality publishing, including Public Library of Science, BioMedCentral, and Hindawi, among others. A new commercial outfit may well be aiming for top quality, but it will (and should) have its work cut out for it to establish a reputation for quality. An indirect measure of reputation is membership in the Open Access Scholarly Publishers Association (OASPA), as OASPA vets members on these quality questions. Note that there is a waiting list of prospective members. Another indirect measure is inclusion of the journal in the Directory of Open Access Journals as DOAJ has a quality control vetting process. Does the journal use CC licensing? Preferably one of the strong CC licenses for open access, including CC-BY, CC-BY-NC, or CC-BY-SA. Is the journal fully open access? Is the journal firmly committed to open access? Asking about participation in OASPA and/or DOAJ may help nudge journals to consider these options. For some, the vetting process may help them to develop best practices in quality control. NEW JOURNALS will not be included in DOAJ, and new publishers will not be listed in OASPA. In these situations, it is best to rely on the academic community involved in the journal as the best indicator of quality. Caroline Sutton, President of the Open Access Scholarly Publishers' Association (OASPA) notes that she frequently gets questions about whether new publishers should be considered trustworthy, and her answer is whether the publisher supports what she articulates as the core values of open access publishers - for details, see her presentation at ALA Midwinter 2011 - towards the end of the presentation. Thanks to Jean Amaral, Sandy Thatcher, Hope Leman, and Peter Suber for contributions to the SCHOLCOMM discussion that inspired this post. References (added November 15, 2011 - thanks to Nicole Gjertsen). Beall, J. Predatory Open Access Scholarly Publishers. The Charleston Advisor 11: 4, April 2010 10-17. Beall, J. Update: Predatory Open Access Scholarly Publishers. The Charleston Advisor 12:1, July 2010 , pp. 50-50. Updated March 29, 2011 (included link to Caroline Sutton's presentation). The purpose of this presentation is to explore options for humanities & social sciences in general, and communication in particular, to advocate for support and growth by articulating our value to the world. What counts is not always what can be counted. In a post-9/11 world, where our emphasis seems to increasingly be narrowing on science, technology, and commerce, we (humankind) should be asking ourselves whether the road to lasting peace could ever come through science & technology, or whether this is a matter of hearts and minds. To avoid the immanent catastrophe of global warming requires nothing less than a global change in behavior. Fixing a global financial system that is prone to the kind of crisis we saw in 2008 will take some creative thinking, not only about economics, but politics, too. The arts and culture are among the very best of what we humans do; they make life worthwhile. My thesis is that it is worthwhile for some of us scholars to spend some time analyzing and explaining why it is that humanities and social sciences in general, and communication studies in particular, matter, because when we do, our societies will soon understand the importance of supporting our work. I will draw on theories of rationalization and commodification (e.g. Weber, Marx, Lukacs) and alternatives, including values rationality (Weber), the commons (e.g. Lessig, Boyle, Ostrom), and transnational advocacy networks (Keck and Sikkink). I will further draw on my background as an open access advocate to provide some examples of how to effectively advocate in this area, and explain why providing open access to our own scholarly work can help us make the case. Proposal submitted March 5, 2011. I am posting the proposal on submission because the work of advocating for humanities and social sciences is urgent. 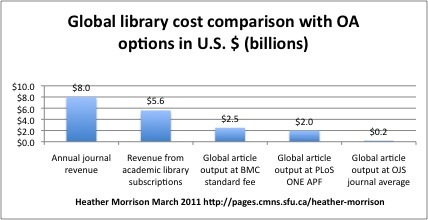 This chart, Global library cost comparison with OA options, illustrates the potential for cost savings with a full flip to open access if we look for efficiencies along the way. On the left, we see the $8 billion U .S. in revenue from journals received by the scholarly publishing industry. Of this, about $5.6 billion is revenue from academic library subscriptions. Compare this to the $2.5 billion it would cost to publish every one of the world's estimated 1.5 million scholarly articles produced annually on a worldwide basis at the BioMedCe ntral standard fee of $1,680, for a total of $2.5 billion. This would be full global open access to scholarly articles at less than half of what academic libraries are contributing to the system now. The savings would be even greater at average PLoS ONE fee of $1,350. On the right hand side, we see what would if happen the current $188 average per-article revenue for journals using OJS were to apply across the board, the global total of $.2 billion would be a tiny fraction of the current spend - less than 3%. The next chart, Comparison of per-article revenue, illustrates what to me is a central point is considering the economics of transition to open access, that is: as we shift the economics from purchase to production, the cost per article is critical in determining the feasibility and sustainability of the system. On the left, we see the average per-article revenue received in the current system of over $5,000. This is compared with the BioMedCentral standard article processing fee and PLoS ONE, about a third of the current per-article revenue. Since both BMC and PLoS ONE are doing well financially, this illustrates that high quality publishing is possible at less than a third of the present revenue. On the right hand side, we see the average revenue for an OJS journal of $188, illustrating that the traditional scholarly gift economy can manage essentially the same work for about 3 percent of the current average revenue. These numbers are meant to be suggestive only, one guideline to consider in the transition to open access. If the goal is an affordable open access scholarly publishing system, it makes sense to support scholar-publishers of the type included in the OJS survey, and it makes sense to support cost-effective charges like the BMC standard and PLoS ONE. 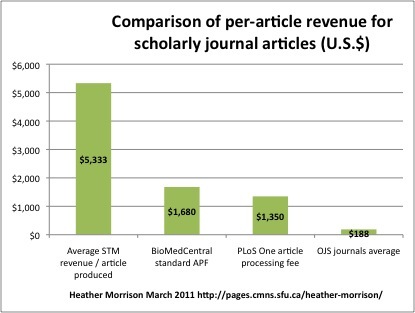 The PLoS ONE and BMC article processing fees are from the respective websites as of March 1, 2011. This post is an update and elaboration of earlier charts I developed for IJPE and various presentations. Typo correction March 5: number of peer-reviewed articles per year is 1.5 million, not 1.5 billion. Thanks to Douglas Carnall for spotting the error.